ABCYA Typing Games Your Child Will Love! Can your kindergartener use your iPhone better than you can? Chances are, he or she has been clicking buttons and snapping selfies with your smartphone ever since they were old enough to hold on to something. Our kids are growing up with technology being a normal, integrated part of their lives every minute of every day. Whether you choose to limit your child’s technology use or not, it’s important that they learn how to properly type to avoid wrist problems later in life and to maximize their work performance and accuracy. ABCYA typing games are an excellent way to help your child practice typing drills while giving them a fun format to play them. Here at Stay A Stay At Home Mom, we love ABCYA because of their mission to make computer learning at home fun and interactive for children while not cutting back on how effective and educational the exercises are. ABCYA’s games really are a perfect blend of learning and fun that your K-5th grader will love. Their typing games are unique, well-designed and education for students, allowing them to learn at their own pace and advance through trial and error. This game is great for young kids who are just starting to learn which order the letters are in on the keyboard. You can select “Beginner” or “Expert” level in the game. Letters, numbers, and punctuation marks found on the keyboard lower one-by-one from the sky at the top of the game. The player has to type the letter that’s falling from the sky before it reaches the ground. The letters, numbers, and punctuation marks come in all sorts of orders and fall at increasing speeds and patterns based on the difficulty and level that is being played. This game is addictive but still educational! Students drive and steer a car down a road and type the words that appear in front of them. If they type the letters in the wrong order or can’t type them fast enough, the player doesn’t earn points. If your child is struggling with a certain section of the keyboard, you can fix that! One of the best features of this game is how customizable it is. Pick and choose which levels you want to play in order to be challenged in specific areas. Pretty cool! Does your student know where the letters and symbols are on the keyboard but need to improve their typing speed? This is the game for them! Cups fall into the game and your child has to quickly type whatever letters or symbols appear on them. If they don’t type fast enough, the cups continue to stack with missed letters. The more accurate and quick the typing, the more points your student can earn! It’s recommended that students mainly stick to using the home of ASDF for the left hand and JKL for the right hand while typing. This helps them to make sure they’re using the proper fingers to hit specific keys and always return back to the correct spot. This is the perfect game for your little youngster to learn the keyboard. This is the most basic, preliminary stages of learning to type. You can choose two options to play the game, either letter names or letter sounds. Students hear these names or sounds and then are encouraged to use their index finger to type the corresponding letter on the keyboard. 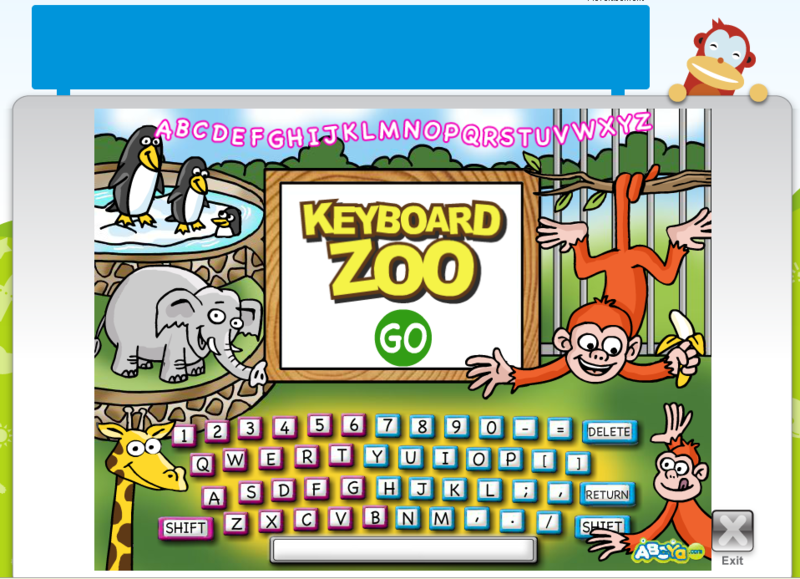 Playing Keyboard Zoo is a great way to quiz your student on their letter names and sounds while giving them some computer time which they all love! These four games are just a few of the many games that are offered on ABCYA. We hope your child enjoys these typing games as much as we do! If you’re looking for more information on ABCYA, check out our blog posts on ABCYA Online Interactive Learning Games, 5 Popular ABCYA 5th Grade Games, and Why Your Child Should Play ABCYA Games!